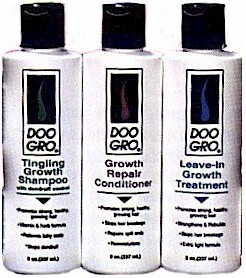 Doo Gro® Growth Repair Conditioner strengthens and repairs hair that has been damaged or abused. This unique formula remoisturizes dry, brittle and chemically treated hair and returns it to its youthful luster. Doo Gro® Growth Repair Conditioner detangles and adds body to hair, while stopping breakage and instantly eliminating split ends and frizzies leaving hair feeling clean and fresh with a beautiful sheen.